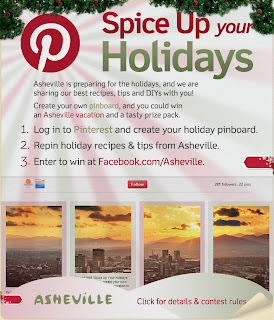 Explore Asheville is giving away lots of prizes including a vacation to Asheville, NC (one of my most favorite places) via a great Pin-It-to-Win-It contest, and you can find all the details here at Spice Up Your Holidays. For those of you addicted to Pinterest like me, the rules are simple! Build a holiday board on Pinterest called "Spice Up Your Holidays," and repin the official contest pin plus four others from their board. Add five more of your own holiday-inspired pins, and then submit the URL via the official entry form here. The contest runs from now through December 21, so head over to get your official contest pin and get going!